Vietnam had been calling out to me for quite some time. So one night I decided that I can’t put this trip off any longer and I booked myself a flight ticket. Given that I booked the ticket only two weeks prior to the trip, I still did manage to get it at a dirt-cheap price (Rs.25k only!!). After all the intense hours at work lately, I had to take this much-needed vacation. This beautiful country situated in Southeast Asia is heavy with history from World War II. I hadn’t made my plan known to my colleagues at my workspace but when my boss asked me where I was headed this time I couldn’t keep it a secret from the guy who approves my leaves in the first place. There are 2 ways. First, you can get yourself a VISA approval letter and seek for visa on arrival at the Hanoi or Ho Chi Minh airport itself which would cost you $31 in total. The second way is to get an E-VISA from India. This is the official Vietnamese embassy link. I had to choose the former option because the Vietnamese embassy was officially closed on account of lunar holidays during that time. Imagine my state of mind knowing that I couldn’t be sure if I was going to get the VISA even though I have already booked my ticket. Things were so dicey that I had no option but to put my faith on the travel Gods and hope for the best. Day 1 – What are the odds of meeting someone I had met 2 years back in Varanasi! People who are familiar with my adventure in Varanasi might remember him. It was so bizarre that we crossed paths on my very first day at Hanoi. Bronzie is a school teacher and had been living in Hanoi for the last 8 months. What a great start to the trip! We decided to catch up again in the late evening. I checked into my hostel. This hostel is one of those party hostels called Backpacker Downtown in Hanoi. 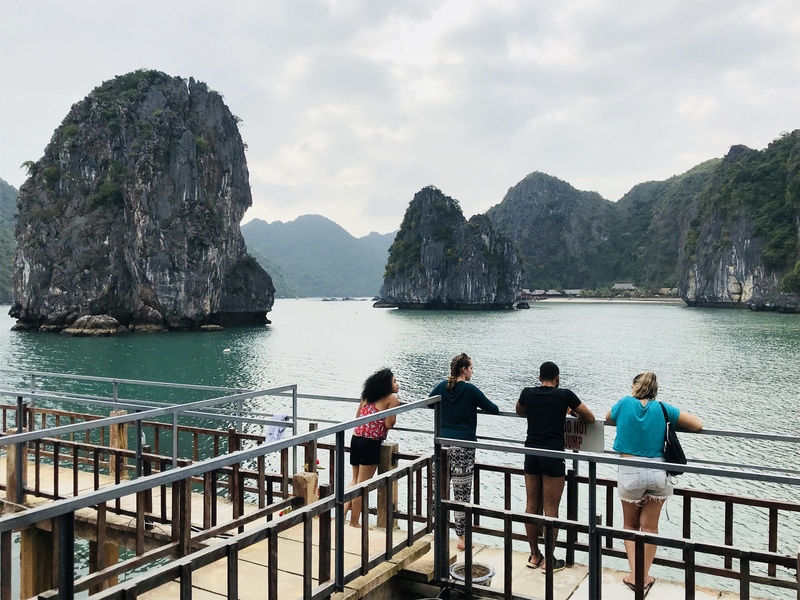 If you happen to read reviews of the cruise tours to Vietnam’s prized possession, Halong Bay, you would know that this hostel boasts of the fanciest and exorbitant Halong Bay Tour called Castaway Tour which costs around 199$. There are plenty of other options about which I will tell you soon enough. Later that evening, Bronzie and I, along with one of his friend, Amber, met for a drink and indulged in local food by the lake. My first night at Hanoi felt so comforting with these two lovely people. Every single dish that I had tasted was so delicious that you are bound to be down with foodgasms. At the end of the day, the best way to explore a new place is by having a local by your side. We decided that we should take the Halong Bay cruise trip to spend the weekend away, especially with the following day being Valentine’s Day. The first day at Hanoi felt almost like work-from-home. Despite being miles away from work, I had literally billed two trucks. Vietnam is an extremely budget-friendly destination. There was no way I was going to cough up so much money for a trip of 2 nights and 3 days. I had already researched my bit on other Halong Bay Tours. I was truly looking forward to a private island experience and a cruise ride. If you happen to be here, you can choose the Hideaway tour which is organized by the Central Backpacker hostel. It costs about 95$ and it’s worth every penny. Day 2. We woke up at 6 am. The time had come to keep us off the radar signal. We hit the road to Halong Bay and some more backpackers on the bus. These travelers were from all walks of life and I cannot emphasize enough on the fact that this is one of the best parts about traveling. It took us about 3 hours to reach the harbor. My, I couldn’t contain my excitement when I finally saw the heavenly view of Halong Bay. If you have played the Call of Duty warfare game with dedication, you must remember the Halong Bay shoot. I remember this from my teenage years and ever since I have looked forward to exploring this place for real. We boarded the cruise and dived into a series of games. Quite literally every game involved chugging down gallons off booze or jumping off the cliff of the ship into the sea. Did I tell you about the Vietnamese cuisines? Oh dear Lord! You better be a non-vegan because a truly Vietnamese platter is loaded with shrimps, pork, barbeque chicken and almost any other seafood that you can possibly name. This particular day in Halong Bay was sort of special and unlike any ordinary day. After several months, Halong bay had seen a bright sunny day. Ask any local and you would know why it is so rare for the sun to be generous in Halong Bay! So while the sun was still golden, we all got busy trying to get the perfect cover picture as well as a group picture to serve justice to this beautiful day in a beautiful place. It was almost dusk when we arrived at our private island. All the travelers, including me, we’re looking forward to this moment and so we all gave ourselves the needed time to enjoy a moment of solitude. At night we all got sloshed by mixing cocktails and playing beer pong games. It was truly a night to remember! The cheeky reason that I say so is that some of us went for skinny dipping. Evidently, I didn’t. Day 3. My readers will be familiar with my travel rule: New place, a new adventure. Vietnam had me trying yet another adventure that I hadn’t laid my hands on before! I’m talking about kayaking amidst the gigantic islands dotting the calm sea. It did feel a little intimidating at first but soon the adrenaline rush took over and it felt so very exhilarating. It felt so right to have found out time for what I had been looking forward to for such a long time now. The same day we got back to Hanoi city. 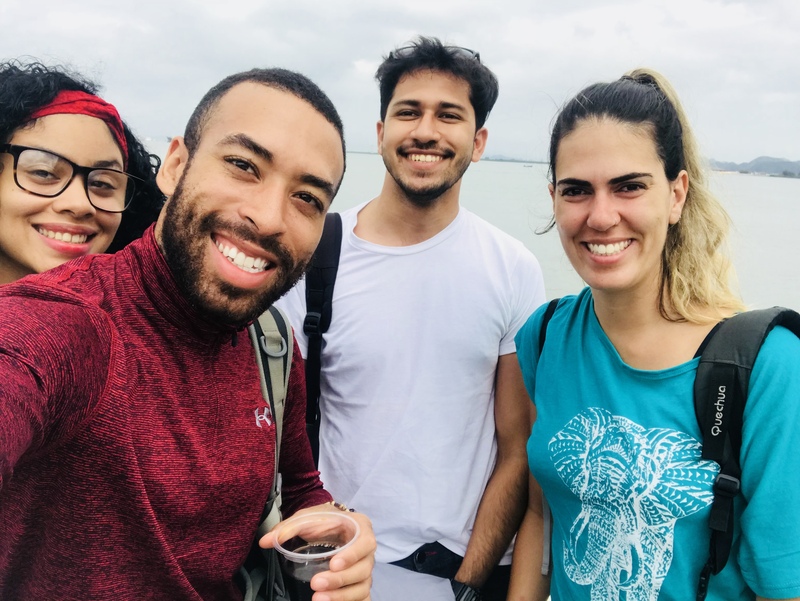 By now, I had already made a friend from Brazil. We went out shopping together and enjoyed a Jazz show later in the evening. 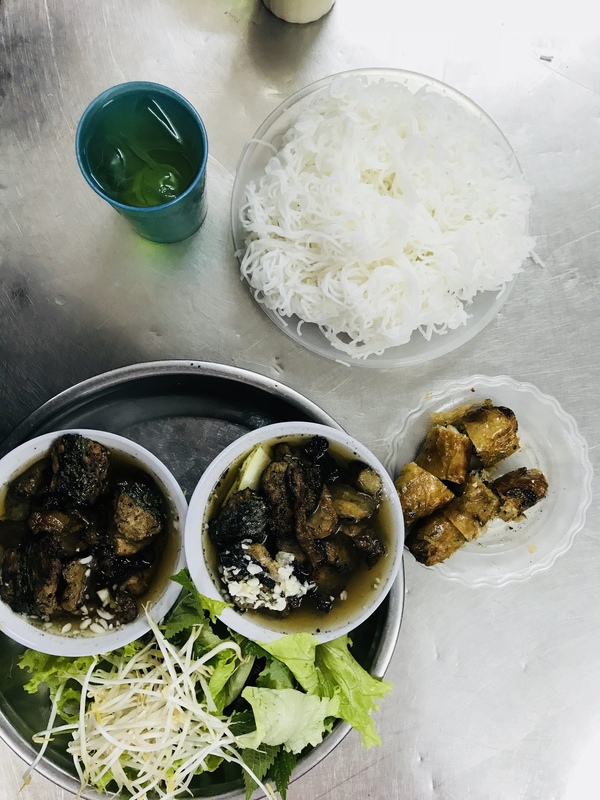 Exploring Hanoi city– I had intended to explore the city on a local scooter. Having Bronzie by my side, it was convenient for me to track down a scooter rental shop. Next, we were off to try the local Vietnamese cuisines (Just can’t get enough of that!). Lately, I have started enjoying the pork cuisines especially of Northeast of India and Southeast Asian countries. Bronzie took me to the best eateries in the city. I had Bun Cha. Midway through the day, he remembered that he was supposed to tutor one of his students for Spanish class. He assured me that he will be back within an hour and meanwhile I was left to wander through the city on my own. Later, Amber joined me and along with Bronzie. 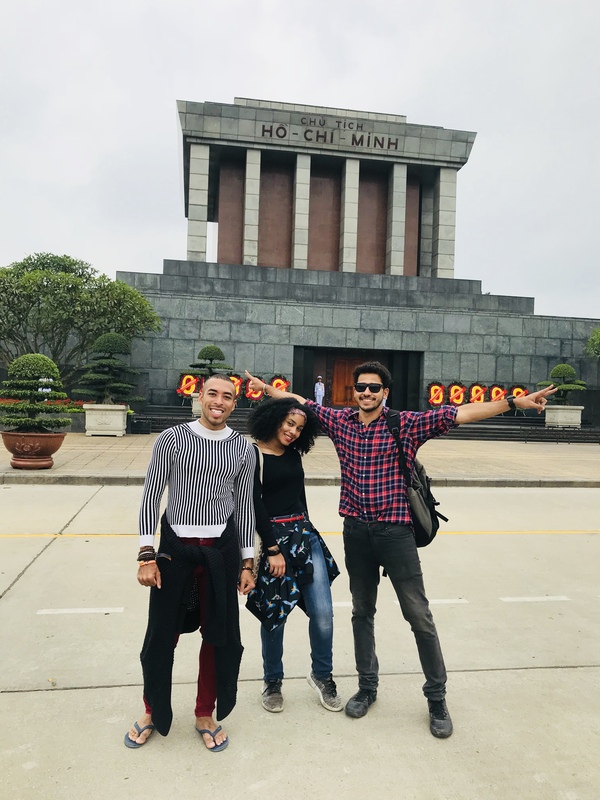 We thought of visiting Ho Chi Mausoleum. You might have heard that during WWII, the Vietnamese army was the only army in the world who could beat the US army because of their guerilla war tactical strategy. This Mausoleum stands as a memorial of that. I couldn’t, of course, leave Vietnam without visiting the most famous Railroad. The reason it is so widely known is because a little warning bell goes off just a few minutes before the train arrives. Within those few minutes, and sometimes only moments before the train rushes by, vendors pull back their specially designed awnings. The coolest thing about this market is that it adjusts itself and perfectly encapsulates the train as it rolls through. The awnings are pulled back only as far as necessary and the baskets of fruits and vegetables are shifted just enough to not be slicked by the train wheels. What a delightful sight, I must say! What was next? 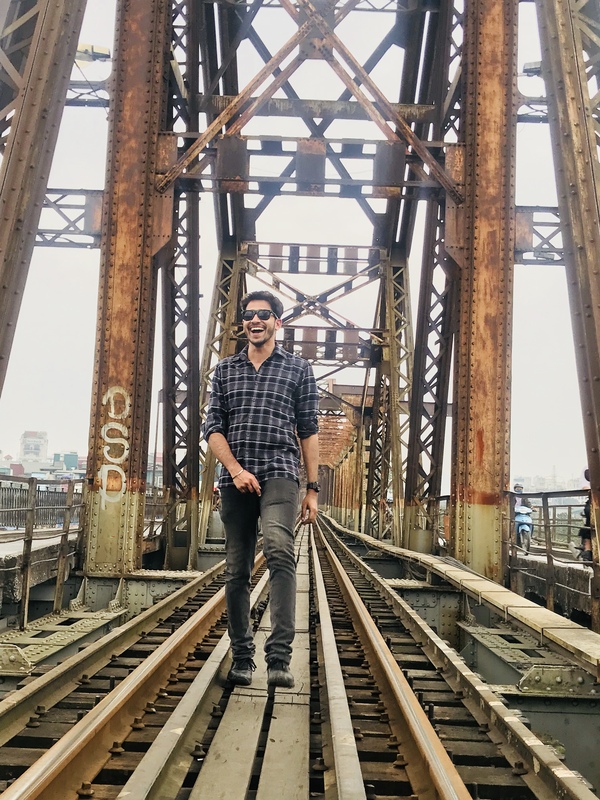 I’m sure if you have been following me on social media, you can perhaps guess that it was time for me to show off my creepy acts at the Long Birn Bridge. It had already gotten late by now and it was time to bid goodbye. The three of us crashed into a tight hug and hoped to see each other again sometime soon in the future. 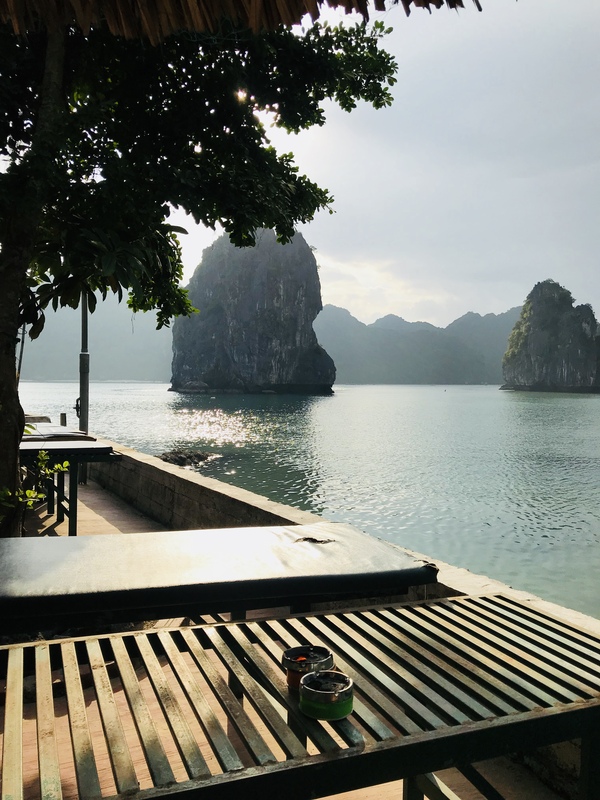 Vietnam is one of the most relaxing and aesthetic destinations if you need a break from the hustle at work. I do hope reading about my experience had eased your mind into planning yourself a trip to Vietnam soon enough. P.S. To save up on my flight expenses, I had chosen to keep Thailand as my transit destination. If you have any queries, feel free to drop a comment.